As preppers and homesteaders, we stay very busy preparing for an uncertain future and maintaining our little slice of creation. Unfortunately sometimes that means some other customary activities get deferred to the another day. We don’t necessarily like it but that’s the way it is sometimes. If that’s been the case for your Christmas shopping, Laura and I have put together a short list of 12 Christmas gift ideas that may help you buy for the prepper on your list. 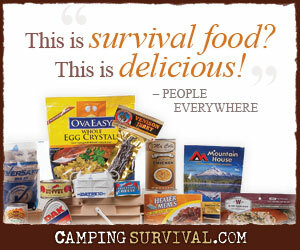 Or, even if he/she isn’t a prepper yet, perhaps you can subtly nudge him in the right direction. These are not “extreme” prepping supplies, so you shouldn’t get strange looks when he/she unwraps your gift in front of everyone on Christmas morning, but the gifts can be helpful during tough times nonetheless. Most of these gift ideas comes with a personal knowledge of them. That is, Laura and I have bought many of these items for ourselves and use them around our homestead. Of those that we don’t own, we looked for highly rated items. A good set of work gloves are definitely worth their weight. They can save your hands from developing blisters while planting in the garden, cutting firewood, or even digging a latrine. These Mechanix gloves are pretty tough yet still relatively thin and comfortable. I’ve used them for some pretty tough work around the homestead and they’ve stood up well. I have punctured them a couple of times on barbed wire fencing. Still few gloves can withstand that for long. As I’ve written before, I used to the headlamps were the camper’s equivalent of pocket protectors. Boy was I wrong! Having good illumination at night while keeping both hands free is great. This Spot Headlamp by Black Diamond has good beam strength, multiple settings for brightness, and even a red light to keep your night vision. I have one and love it. Carla Emery’s The Encyclopedia of Country Living is quite simply a must have resource for the prepper and homesteader. It’s packed with great information that you’ll need for surviving and living a self-sufficient lifestyle. For more information, have a look at the review that Laura posted a while back. John “Lofty” Wiseman, a 26-year veteran of the British Special Air Services, has shared his knowledge of survival techniques in The SAS Survival Handbook. In it he describes how to build the best shelter for your environment, how to find and purify water, how to preserve food, how to build snares that work while you’re sleeping, and much more. The outdoor enthusiast will enjoy this book; I’ve enjoyed mine. Give a man a fish, as they say, and he’ll eat for a day. Teach him to fish and he’ll eat for a lifetime. The same applies to growing food as well. Heirloom seeds, such as these, haven’t been crossbred or genetically modified. The thrifty prepper can save seeds year after year and have a garden for a lifetime. Every chef, every Boy Scout, and every prepper knows that a good sharp knife is essential. It’s a versatile tool with a multitude of applications. But keeping a knife sharp can be a challenge without a good sharpener. Some can be found in the big box stores for under $10. Others are north of $200. I’ve found that this America’s Stone ceramic sharpener does a great job at a modest price. Having a reliable and long lasting way to start fires can be mean the difference between being cold and warm, between having fresh water and going thirsty, between having cooked food and going hungry, between life and death. Fire cannot be overstated. This FireSteel from Light My Fire is what I use to start my fires. It’s absolutely great to grow your own garden and raise your own food. But what happens with the garden is out of season? How can you enjoy the produce of your hard work during the cold winter months? With a water-bath canner you can store high-acid fruits, preserving them for a time when fresh food is less abundant. And there you have it. Twelve items that the prepper on your list may enjoy for Christmas, and each one is less than $50. Got some more suggestions? We’d love to hear them.